Home » People » Despatch from a Dominican » Why do we venerate the saints? Why do we venerate the saints? 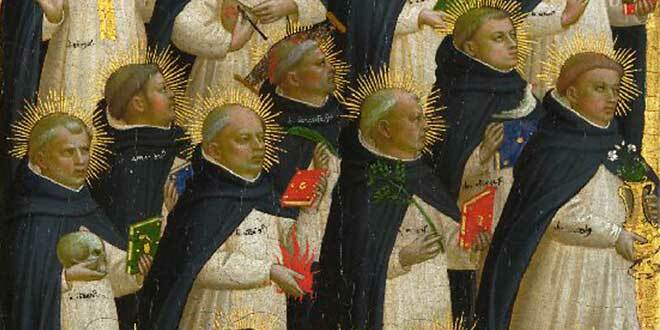 Saints of order: The Dominican Blessed about 1423-4, probably by Fra Angelico. WHEN attending Mass in Brisbane a few months ago I had my first experience of déjà vu. One parishioner suggested I make up business cards with my name and the contact details of the order. He suggested that I put our bank details on the back of the card and – when handing it over – that I should fix my interlocutor with a winning smile and the phrase, “No personal cheques”. As winsome a suggestion as that was, I thought I might be better off using this column as an opportunity to recall just a few of the Dominican saints whose feasts occur in November. It seems an appropriate moment to embark upon this quest, given that we began the month with the feast of All Saints, and November is a time when the Church pays particular attention to those who have gone before us marked with the sign of faith. Also, there are few better ways to understand the inherent nature and charism of the Order of Preachers than through its many canonised saints. However, before beginning my panegyric to my brothers in religion, it occurs to me that there is a doctrinal point that might be worth exploring. Why, after all, do we venerate the saints? Why does the Church designate certain days throughout the year as memoriae, feasts and solemnities dedicated to particular saints? Is Jesus Christ Himself not enough? The answer to those questions – questions which have all been asked of me at one time or another – is really quite simple. The answer is this – the brilliant lustre that the saints show through their lives is nothing other than the splendid glory of Christ Himself. The saints are a proof of the infinite power of God and the work of the Holy Spirit in our midst: that power which is forever capable of calling forth eternal luminous souls from the pervasive dust and sin of our world. We who venerate the saints are adoring Christ, as it is from His power that they emanate and it is to His true divinity that they bear witness. It is for this reason that, over the course of the year, the Church has surrounded the great feasts of our Lord Himself with feasts of the various saints like a garland. They bear witness to the action of the Son of God throughout the course of the history of the Church within this world. The saints testify to His actions and His passion, His resurrection and the gift of His Spirit. In the lives of the saints the effects of the Life of Christ and its undeniable fruits are brought nearer to our hearts and our minds. And so we celebrate men like St Albert the Great (1200-1280: November 15), one of the thirty-six Doctors of the Church. He is named the “Universal Doctor” in view of the breadth and depth of his writing which covers everything from logic, theology, botany, geography, astronomy and astrology to mineralogy, alchemy, zoology, physiology, phrenology, justice, law, friendship and love. In the Divine Comedy, Dante places St Albert in the Heaven of the Sun. He earns a mention in Mary Shelly’s Frankenstein and even has a font named after him (Albertus). The manner in which St Albert understood his analytical work as an inherent part of life as a professed religious and priest is a trait that continues among the friars with whom I live. This commitment to study and the contemplation of revealed truth has ever been a part of Dominican life and is aptly summed up in the relevant section of our Constitutions: “God is the light and source of our study, the God who spoke in former times and in different ways, and who now speaks in Christ”. St Albert the Great testifies to that light of God and the work of the Holy Spirit by his life and work as a priest and bishop in Germany in the 13th century. His brother in religion, St Martin de Porres (1579-1639: November 3), also shines forth as a brilliant ray of compassion during the 17th century in Peru through his life as a co-operator brother. Known for his heroic charity in caring for the sick, the poor and the dying, he is also especially remembered for his great devotion to the Eucharist. Actually, the thing he is probably best remembered for is the so-called “Legend of the Rats”. The prior of the convent in Lima wished the place to be rid of rats – an understandable position – and to this end asked St Martin to put out sufficient poison to ensure that the unwelcome guests were transported to their own version of the elysian fields. St Martin did as he was asked, but apparently felt rather sorry for the rats: he went out into the garden and – much like the pied piper of Hamelin – called softly in the direction of the convent, summoning the rats to him. He reprimanded them for their boorish behaviour and informed them of the poison. He further assured them that he would bring them food in the garden every day if they made efforts to avoid annoying the prior. The rats agreed to this handsome offer and, so the story goes, Holy Rosary Convent in Lima was never again bothered by rats. The stellar example of St Martin lives on in the co-operator brothers of our own day, though I am given to understand that rats in our convents are less receptive to kind offers than they have been in the past. If it came to a contest between feeding the brethren and feeding our mammalian friends, I doubt many of us would be as conflicted as St Martin. On the topic of food and cooking, however, I am reminded of a most memorable story told within the English province of the order – originally recounted against himself by the then Father Provincial Anthony Ross, who was apparently a rather grand gentleman – concerning a cook in the London house of that province, a certain Brother Columba. When Br Columba was dying, he turned his face to the wall and remained silent for three days and did not take any food. So Fr Anthony went into Br Columba’s cell, to say a few words. “Brother Columba, I would like to say to you on behalf of the whole community, that over the years the food has been delicious,” he said. Still no movement from Br Columba, who remained silent and kept his face to the wall. “Not only that”, Fr Anthony said, “I have often attributed my own great success as a preacher to your own humble prayers”. It is often the crucible of fraternal communion that makes saints – as well as hilarious stories. In living our common life within the Order of Preachers we are supposed to be emblematic of the early Church in Jerusalem, as described in the Acts of the Apostles. Occasionally some friars in the order have been fortunate enough to truly spread the Church throughout the world – they chose to embark upon long, perilous voyages to mission territories to bear the Gospel to those who had not yet heard it. Often enough, these brothers of ours were given the opportunity to testify on behalf of Christ in the original sense – the word “martyr” does, after all, mean “witness” in Greek. At the same time that St Martin de Porres was radiating the light of Christ in South America, our brethren on the other side of the Pacific Ocean were bearing witness to the fact that Christ has Himself broken the bonds of death through the often painful and abrupt end to their own mortal lives. During the terrible persecutions of Christians in Japan during the 17th century, Blessed Alphonsus Navarette and his companions (1622: November 6) suffered and died alongside their Catholic brothers and sisters. They may not have featured in any recent film by Martin Scorsese, but their dedication to the crucified Christ and the flock that had gathered about Him on those islands bear all the marks of heroic sanctity. The same can be said of their brothers who appeared in Vietnam just over a century later: St Vincent Liem and St Hyacinth Castañeda and their many companions (1773: November 24). Their martyrdom took place during the horrific persecution in Tonkin during the 18th century. The moving accounts of their trial, in particular, bring to mind the alternatively laconic and eloquent responses of Christ when questioned by Pontius Pilate. Even more striking is the fact that St Vincent – a native of Vietnam and thus exempt from the death penalty, despite his Christianity – insisted on being subjected to the same torture and end as his Spanish brother in religion and in Christ: “We both profess the same religion in life, and the same we will profess in death”. And that is a further fundamental reason why we venerate and celebrate the saints: because, representative of the Church triumphant, they are the brothers and sisters of we who are as yet upon earth and comprise the Church militant. St Albert the Great, St Martin de Porres, the martyred saints of Japan and Vietnam: all these Dominican brothers of ours shine before us as brilliant rays of the Son of God, Jesus Christ. And in celebrating these saints we are all called to lives of sanctity ourselves: to be the rays of Christ’s light in our own time, breaking through the gloom that occasionally seems to pervade our world.